Monoprint on paper. 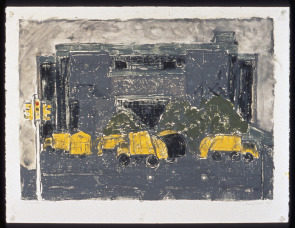 Artist's caption: "There was a city incinerator at Spring Garden Street where the Festival Pier parking lot is today. From a distance, the trucks going up the ramp looked like giant yellow bugs."